Amid all of the recent trades and uncertainty about the future of the franchise, the Celtics were able to defeat the Pelicans 108-100 last night at The Garden in a game that featured a career performance from Jae Crowder and a battle for the ages between Jared Sullinger and Anthony Davis. The C’s got off to a bit of a slow start, shooting just 37% in the first quarter. Fortunately, the Pelicans only shot 40%, so Boston was able to remain close. Thanks to Jae Crowder’s defensive hustle and 11 second quarter points, the Celtics were able to tie up the game by halftime. Crowder went into the half with 15 points, 3 steals, and 3 assists. The game remained competitive throughout the third, and the Celtics went into the 4th trailing by four points. To start the 4th, Boston got off to a 8-0 run, which was countered by a 5-0 run from New Orleans. Sullinger and Davis continued to go back and forth down the stretch. At one point, Sully scored five straight points for the C’s to bring them within one. When Davis buried a couple of free throws, Sully immediately responded with a three to tie the game at 90. After a couple key stops by Sully on Davis, some traded free throws, and a Marcus Smart floater, Avery Bradley buried a fade away with 1:41 remaining to push the Celtics’ lead to five, their largest of the night. After free throws brought the lead back down to one, Marcus Smart hit the shot of the night when he sank a contested three from the corner in the face of Tyreke Evans with 40 seconds to go. From there the Celtics were able to hold on for an impressive and unexpected 108-100 victory. 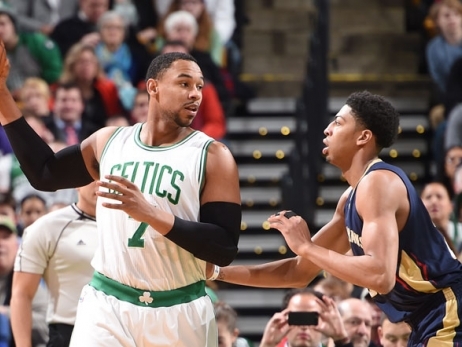 The star of the game for the Celtics was Jared Sullinger. Although he didn’t shut down Anthony Davis (which is impossible), he was able to come up with some big stops against him in key situations. The match up between Sullinger and Davis was certainly fun to watch as AD finished with 34 points and 9 rebounds while Sully turned in a double double, dropping in 27 points and grabbing 10 boards. Avery Bradley continues to be inconsistent offensively as he turned in an overall poor shooting night despite a clutch jumper in the 4th. He was just 3-10 from the field. Tyler Zeller struggled mightily, going 1-9 with 2 points and 4 rebounds. Kelly Olynyk once again found himself in foul trouble. He picked up five in just 14 minutes of play. Olynyk currently leads the NBA in personal fouls. I hate to dwell on the negatives, though, as this was a huge win for a team that has been through a lot of changes lately and appeared to have the odds stacked against them. The Celtics will take on the best team in the Eastern Conference tomorrow as the Hawks come to Boston. Tip-off is at 8:00 pm ET.